Most dictionaries define a "trend" as "a general direction in which something is developing or changing". 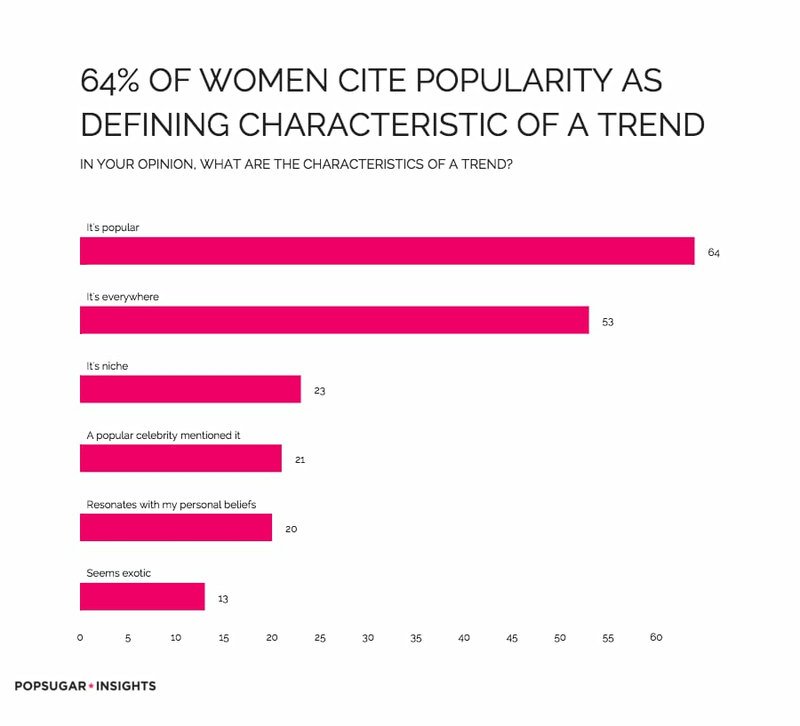 As part of the POPSUGAR Insights Content, Commerce, and Culture study, we surveyed over 1,500 women between the ages of 18-44 and asked them to go a bit deeper and define what they consider to be the key characteristics of a trend in their own words. Overall, 64% of women said that something could be considered a trend because it's "popular" with a lot of people talking or writing about the topic. Over ½ (53%) of women said the key characteristic of a trend was its ubiquity, the fact that it seems to be everywhere all at once. Nearly 23% of women said the opposite, saying that the key characteristic of a trend was that its "niche" and the right people are talking about it. Twenty-one percent of women say something could be considered a trend if celebrities are talking about it and 1 in 5 women said something is a trend when it resonates with their personal beliefs and feelings.